By Chelsea Cafiero · May 12, 2017 • For this great room home theater, a technologically-informed homeowner called in Brandon Smith Audio Design to install a Digital Projection Insight 4K Laser Projector, Screen Innovations screen, Control4 control, Dolby Atmos and Gelenec speakers with custom cabinetry. 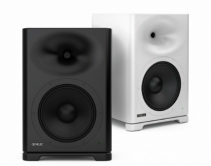 By Robert Archer · November 23, 2015 • Genelec has added to its line of Smart Active Monitoring (SAM) product line with the debut of the 1236 loudspeaker. By Robert Archer · October 30, 2013 • Genelec is supporting its G Series active loudspeakers with two new small footprint subwoofers, the F One and F Two, that employ 6- and 8-inch woofers, respectively. Genelec has also announced a new distributor for Italy. By CE Pro Editors · July 18, 2011 • Dealers can see SIM2's new LUMIS 3D SOLO three-chip projector, as well as its single-chip DLP Crystal series projector. By Robert Archer · March 12, 2010 • The European company's new active loudspeaker can be used for professional studio usage, as well as high-performance consumer applications, including home theater and desktop, computer-based audio systems.